This review of Star Wars Battlefront II: Inferno Squad contains very minor spoilers. Star Wars Battlefront II: Inferno Squad by Christie Golden (Dark Disciple) is the latest media tie-in for the new canon. Inferno Squad is the precursor to the highly anticipated Star Wars Battlefront II video game, scheduled for release this fall. However, as with its predecessor Star Wars Battlefront: Twilight Company, Inferno Squad is something all fans can enjoy, whether they be gamers or not. It works perfectly well as a standalone novel. As with previous releases, such as Lost Stars, Tarkin, and Rogue One: Catalyst, the events of Inferno Squad are seen primarily through Imperial eyes. For those who are enamored of the Empire, that’s a pleasing state. For those of us who are more Rebellion-minded, it presents challenges. How can you find a way to sympathize — or empathize — with the enemy? A few books into the new canon, and I’m still working that out. It does happen, though! And Inferno Squad is an excellent example of when it does. The titular Inferno Squad is an elite force made up of best of the best the Empire has to offer. Iden Versio is an accomplished TIE fighter pilot, survivor of the Death Star, and daughter of Admiral Garrick Versio and Imperial propaganda artist Zeehay Versio. Gideon Hask is also a TIE fighter pilot, a true believer in the Empire, and a longtime friend/competitor of Iden. Del Meeko is engineer extraordinaire with a comfortable and friendly demeanor. Rounding out the group is Seyn Marana, a naval intel officer with an eidetic memory and a gift for languages. She is the least experienced of the group, having spent most of her service behind a bank of computers. Inferno Squad is her first field assignment. Admiral Versio assembles the Squad in response to the growing threat of a group of extremist rebels known as the Dreamers. The Dreamers grew in the aftermath of the death of partisan leader Saw Gerrera in the Death Star’s attack on Jedha, and they need to be wiped out. To that end, Iden and her team are to infiltrate a cell and gather what intelligence they can that will be helpful in eliminating the Dreamers once and for all. Iden, suffering a fair amount of survivor’s guilt in the wake of the destruction of the Death Star, and trying to live up to her father’s nearly impossible standards, sees this as a way to distinguish herself once and for all. On a certain level, this is a very personal mission — although that might not be something Iden would like to admit. In Iden, author Christie Golden has created a character who is Imperial through and through. Rather than being purely militaristic, however, Golden manages to humanize her in a way that doesn’t take away from what Iden believes herself to be. Over the time Inferno Squad spends undercover among the Dreamers, we begin to see the humanity in all four team members. As they work among the Dreamers (who they see as terrorists, and indeed some of their actions support that view), and with each other, they begin to see areas of common ground. They also realize that not everything is black and white. There’s more gray in the conflict between the Empire and the Rebellion than perhaps they initially believed. There are several twists in the story — one can imagine Golden having fun with a few — and some are complete shockers. During the course of the book, I became emotionally invested in characters on both sides, so I found some moments heart wrenching. Another thing Inferno Squad does well is act as a bridge between the movies (Rogue One and A New Hope), the animated series (particularly The Clone Wars), and previous novels in the canon. 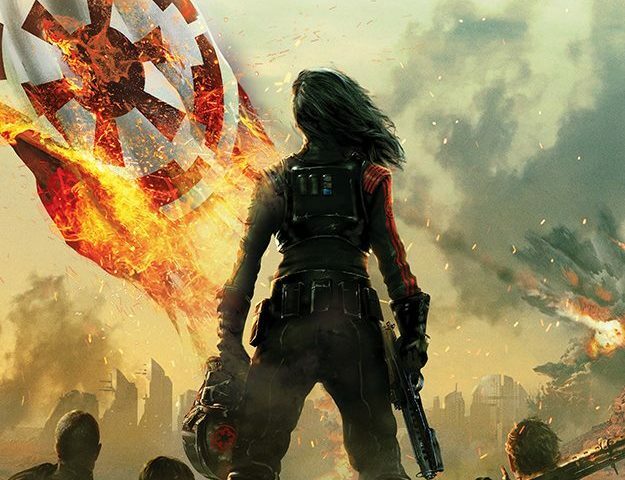 Your enjoyment of Inferno Squad will greatly benefit from having read Rebel Rising (by Beth Revis) beforehand. It’s not necessary, but I would recommend it — and Rebel Rising in a fine book on its own. Even reading Lost Stars (by Claudia Gray), if you haven’t already done so, gives you additional perspective on how Imperials viewed the destruction of the Death Star compared with — to their way of thinking — the fair destruction of Alderaan. I love seeing all aspects of the Star Wars universe come together in a cohesive way through the films, books, comics, and television series. It can be a lot to take in at times, but there are moments in Inferno Squad that make it worth the effort. To sum up, Christie Golden has created another yet another satisfying entry in the Star Wars canon. For those who will continue on with the characters of Inferno Squad into Battlefront II, this book will certainly whet your appetite. For those us of non-gamers, Inferno Squad introduces us to the intriguing, complex, and at times all-too-human characters found on both sides of the galactic conflict. You can purchase your copy of Inferno Squad here. Thank you to Penguin Random House for providing a copy of this book for review purposes.